This article looks at the Komsomol, the fearless youth group of the Soviet Communist Party. To my delight and surprise, Russia Profile (1) continues to feature articles on Russian youth. “The Roads Not Taken” (2) by Dmitry Babich examines post-Soviet youth organizations as avenues for youth politics, instilling patriotism, and participation in social life. Babich is correct to note the important role youth played in putting pressure for reforms in the Soviet system; and he is right to place youth on the forefront for changes in Russia. As he notes, youth played a vital role in the Ukraine’s Orange Revolution. The protests during the Belarusian elections were mostly comprised of youth. There is a possibility, if not an anticipation, that Russian youth will play a similar role in the future. If youth are slated to play such an important role in Russia’s present and future politics, it is important to get an idea about their history. The history of Russian youth organizations parallels the history of youth organizations globally. Fraternities, nascent youth groups and organizations began in Russia around the middle of the 19th century in universities. The first mass youth organizations like the Boy Scouts were founded in Europe, the United States, and Russia in the late 19th century. Adults like Robert Baden-Powell, the founder of the Boy Scout movement, began organizing youth out of fear of their corruption and the degeneration of the social body. Similarly, the German Youth Movement was a direct reaction to modernity and the perceived corruption of society. It looked to German tradition and nature as a way to purify the young body politic. Like many groups today, they also focused on cultivating mostly male youths into leaders and had a strong concentration of physical fitness, military preparedness, religious worship, nationalism, and morality. For this reason, 19th century youth organizations were primarily open to middle class youth. Working class and peasant youths tended to be excluded. 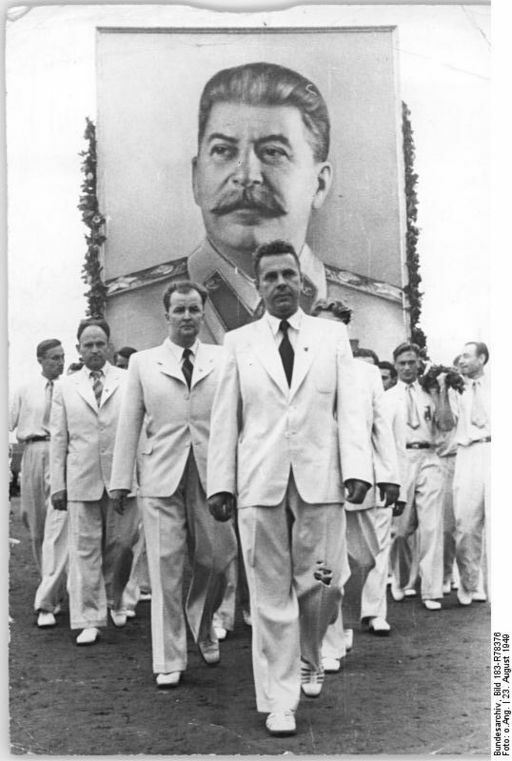 Komsomol members in Budapest, 1949. Determined to become a mass organization for worker and peasant youth, the Komsomol grew rapidly in the 1920s, becoming in some places in the country the only representation of Soviet power. By 1928, its membership was 2 million; in 1939 it reached 9 million. It wasn’t until the mid-1950s that the Komsomol made significant inroads into the Soviet Union’s youth population. In 1954, it boasted a membership of over 18 million. Semyon Charny, a Moscow historian who studied the social movements of the late Soviet period for the Russian State Humanities University (RGGU), thinks that the passivity displayed by the youth at the time can be explained by a lack of experience. I have no idea why they were “shocked”. Such reports were standard fair in the 1920s and I can present several examples of such and even worse behavior among Komsomol youth. In the countryside, for example, Komsomol mass meetings sometimes turned into mass brawls as “non-party” youth showed up from neighboring villages. Usually the cause of this had to do with, you guessed it, girls. Often youths from neighboring villages showed up to village parties (posidelki). Tensions between males would arise with the outsiders would begin hooking up with local girls. Drunken fights often ensued. In fact, in 1926 the Komsomol leadership came up with a name to encapsulate misbehavior among its members: “sick phenomena” (bol’eznennie iavleniia). “Sick phenomena” meant hooliganism, drunkenness, and sexual perversity. The late 1920s saw an increasing number of expulsions for these offenses as the Komsomol tried to get a handle on the activities of its membership. Unfortunately for them, their efforts were to no avail. While many would like to perceive the Komsomol as some unified and totalitarian organization that had Russia youth in its grip, a quick glance at the newspapers from the period shows otherwise. The tradition of not listening to the “base” is still very much alive in Russia, and the strategy of some youth movements is built on fighting what they label an unresponsive and irresponsible state. One charge against the present regime is that it increasingly looks to the young to demonstrate their patriotism while offering little in return a criticism also heard in Soviet times. One example was the negative reaction on the part of opposition party youth groups to the publication of the Program for the Patriotic Education of Russian Citizens, signed into law in June 2005. The program attempts to instill patriotic values through portraying national symbols in the media and arts as well as developing patriotic sports clubs and summer camps. The idea behind the program is that Russian patriotism can no longer be taken for granted, but must be reinforced by all segments of society that touch upon the lives of young people including the arts, education and business. For some groups, however, the contents of the report were another opportunity to criticize the current government, and the presidential administration in particular. However, such a view is in the minority among youth organizations. If the state supported Nashi is any indication, many politically organized youths believe that the state does and should have a role in these areas. Finally, there is one story about youth organizations in Russia that is now starting to be told: the role of the Komsomol in perestroika and in planting the seeds for Russia’s capitalist economy. As Babich reminds us, many of the Oligarchs began their road to riches in Komsomol enterprises in the late 1970s and 1980s. Komsomol cooperatives in computer technology and construction became not only vehicles of economic reform (the Communist Party essentially flooded them with hard currency to buy computer equipment from the West to refurbish), when the system collapsed they were some of the few sectors of society that had reserves of Western currency. Many of the Oligarchs that we’ve come to know and love formally took control of those assets when the system imploded. This is a fascinating story that has yet to be fully uncovered, though I know a few people in Russia now working on it. Sean is the owner of Sean’s Russia Blog, available here. This article originally appeared on that site. For more on the Soviet Union, check out our Cold War podcasts here. 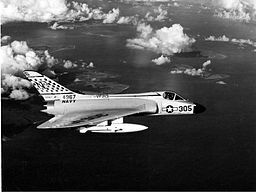 As people who follow the site will know, our main focus to-date on the site has been on the Cold War. That war’s intrigues made the second half of the 20th century. From the Berlin Crisis to the Vietnam War, and the Korean War to the Soviet invasion of Afghanistan, that war defined nearly 50 years of world history and continues to impact our world. We’ve previously released a few books on the early and middle years of that war, and one more will come later in the year. That book will focus on a particularly volatile period in the Cold War, the years from 1979 to the end of the Cold War. In our last book, you may have read that relations between the super-powers collapsed as the 1970s came to an end. A more assertive Soviet Union led to many in the US fearing that the Soviet Union planned to seriously challenge them for global hegemony once more. In the 1970s, the Soviets strongly supported various regimes in Africa, improved their missiles, and finally launched an offensive in Afghanistan on Christmas Day, 1979. A worried US then underwent tumultuous change, and the outcome was that Ronald Reagan became President in 1981. Something akin to a paradigm shift then occurred in US-Soviet relations. Reagan’s administration massively increased defense spending, and with it, the world abounded in danger; however, a second paradigm shift then occurred as a very new and different Soviet leader emerged. Ultimately it would be the actions of these two men that caused the Cold War to end. You’ll have to wait a few months for the book, but while you wait for it, we’ve got some educational materials to share with you. The first of these looks at the origins of the Cold War. It is widely held that the Cold War began in the mid-to-late 1940s – 1945 is generally the most popular choice. In our podcast series, we considered 1945 to be the start year; however this article looks back at the pre-1945 world and considers different times in which the Cold War could have started. As you will see, some think it started with the Communists gaining power in Russia during the 1917 Russian Revolution. After that revolution, many in the West, such as Winston Churchill, were keen to crush Communism as they feared its spread across Europe and the world. The second of these materials considers the Cold War in its entirety by looking at the main events in three different periods. If you’ve listened to the podcasts or read one of our books, this is a great analytical took that recaps some of the main points and asks some key questions about the war’s events. PS – you’ll have seen that the blog has been more active this week. And we plan to keep it that way! We’re always looking for new contributors, so if you’re interested get in touch. Or, click here to find out more. The materials are supplied courtesy of our friends at www.explaininghistory.com. You can find out more about the Cold War by going to our Cold War page – click here. Two of the focus areas of our blog are 20th century history and Communism. In this article, Brian Schmied looks at the struggles that the Church faced in the Soviet Union in the Communist period, and argues that it has become a powerful force in Vladimir Putin’s Russia. The Russian Orthodox Church is an integral part of Russian society, and a powerful political force. Not long ago, that would have been unthinkable. The Russian Orthodox Church has moved out from under the heel of brutal suppression and near extinction, to political dominance within the lifetime of most people reading this. Communism, with its state atheism, had an official policy of religious tolerance that permitted the existence, but not the propagation of religion. Its rise resulted in the confiscation of the vast lands and property of the Orthodox Church. It was illegal to criticize atheism and to proselytize, and there were massive government led efforts to end religion through education and persecution. It did not help that the Orthodox Church opposed the rise of Communism, encouraging believers to fight against the new regime. When Lenin abolished religious education and the privileges and legal status of the Church, the Patriarch excommunicated the government, which led to mass executions of clergy. Almost 600 convents and monasteries were liquidated and the inhabitants executed in those first few years, and it only got worse with time. In 1929, the USSR outlawed all distribution of religious materials and proselytization. Special taxes implemented for the clergy raised their total taxes to over 100% of their income. Debtors were carted off to Siberia. Then Stalin came to power. He purged the Russian clergy in 1938, executing an estimated 100,000 of them on the spot, and arresting the rest. Just as it looked like religious expression may be fully stamped out, World War II broke out and brought it back. The Nazi invaders reopened churches in conquered Russian territory. 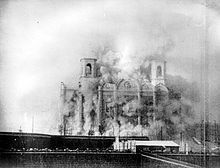 Stalin, fearing that this might make the still largely religious Russian populace sympathetic to the Germans, ended his campaign of persecution and reopened the churches. The number of churches recovered to over 20,000 within a decade, but, like the war, it did not last. In the late 1950’s Nikita Khrushchev, resumed the persecution. All of the previous laws were enforced again, and a few new ones added. By 1963, it was illegal to bring a child to a church service, and to administer the Eucharist to a child over the age of four. Time wore down the conflict, however. The Russian Orthodox Church ended its feud with the state, endorsing its various accomplishments and integrating with the KGB to ensure their survival. The Russian state granted reprieve, weakening restrictions, allowing theological schools to open and train clergy, and allowing people to privately fund churches and hire priests for their communities. It wasn’t until the Gorbachev’s glasnost policy, however, that ownership of some Russian churches was returned to the institution. 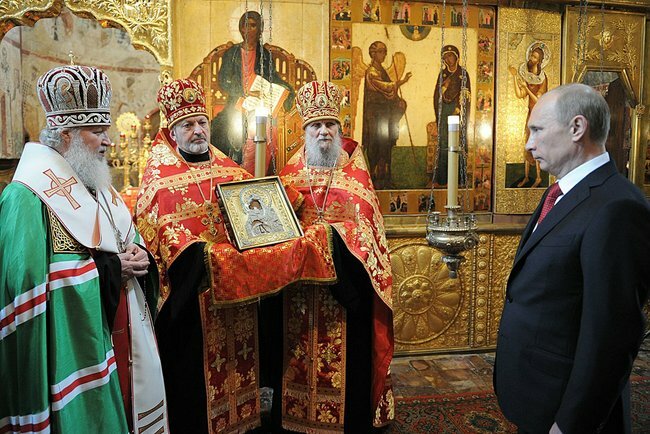 The Russian Orthodox Church has bounced back. While Russians are not overly religious, with only about 15-20% practicing Orthodoxy, far more Russians identify with the Russian Orthodox Church. Russian nationalism has become tied to the religion, driving many conservatives, neo fascists and anti-foreign elements, into the arms of the Church. Perhaps because of his ties to the former KGB, Vladimir Putin has built a strong bond between the Orthodox Church and the Russian State. He has voiced support of increasing the political influence of the Church, and the Church has voiced their support of him in turn. The Patriarch, rather than fearing execution, like his predecessors, now walks the halls of the Kremlin in return for bringing the votes of the faithful. The orthodox people of Russia no longer fear the desecration of their holy sites by their government, but rather call for support in protecting them. There are scientologists are facing possible legal action on behalf of the Orthodox Church against their worldwide expansion efforts. Russians protesting these Scientology proselytization efforts claim, “…anyone who cares about the survival of Russia must join the body of the Russian Orthodox Church.” Mere decades ago the same statement would have brought the KGB to your door. Already by 2006, Russia boasted an impressive 27,000 Orthodox parishes and over 700 monasteries. Religion is uncharacteristically popular with the youth, as it helps them establish a cultural identity and connects to the international Russian community. As of 2007, the Moscow Patriarchate has brought the Russian Orthodox Church Outside Russia, which split off when the Soviet Union cut Moscow off from the world, back into the fold. Do you agree? Has the Church really become a major force in modern Russia? Let us know your thoughts below..
Brian Schmied loves to learn about the history of religion and politics. He has a B.A in political science, and enjoys writing because it pushes him to think analytically and objectively, and to learn new things. Yakovlev, Alexander. Paul Hollander transl. A Century of Violence in Soviet Russia. Yale University Press, 2004, Pg 165. Sixty years have come and gone, but the sun has yet to set on the Taiwan Straits Crisis. Stranded on the rocky island of secrecy amid the storms of the Cold War (1947-1991), the mists of time should not be permitted to veil the lessons that must be learned. In the U.S. during the early 1950s, Eisenhower was in office, China was engaged in a civil war, the Soviets were antsy, and the Air Force longed to hear the words ‘the pickle is hot’, indicating they were free to unload armaments. The only thing missing from the high-tension plot was a bevy of brilliant beauties unless, of course, you consider Madam Chiang Kai-shek and Hedy Lamar. Remember - click here to find out more about the magazine!